If you're looking for climate change deniers, you won't find them here. Too many people have seen it first-hand. "It used to rain," sighed Betty Yazzie, 81, speaking in Navajo. "It used to rain a lot. All these washes, people used to plant corn, squash and melons. People knew how to keep food through the winter. Nobody went hungry. Tolikan was known as a place where there was plenty of food for people, plenty of food for animals. "Now there's no rain. Nothing but wind every day." And these same elders who once proudly grew enough food to cook for their families and share with neighbors are here in the senior citizens center, eating their lunch. At least, three of them are. It's the first Friday of the month and the rest -- usually about 30 -- are in Farmington cashing their public assistance checks and stocking up on supplies, said Sadie Tsosie, the center's bus driver. The senior center, in turn, waits for the Sysco Corp. truck to bring its provisions. But the lack of rain is just one of the many problems here. Although it's only about 15 miles from each of two major highways -- U.S. 191 and U.S. 160 -- Tolikan feels as remote as any chapter on the reservation. The reason is that that 15 miles is so sandy and washboarded, it takes nearly an hour to drive here from either Rock Point or Red Mesa, Ariz.
"We've complained for about 50 years," said Tsosie. Finally, they're starting to pave 6.8 miles of the road to 160." That's a start, as people usually head that direction to load up on groceries at Cortez, Colo., or Farmington, each about a 65-mile trip one way. 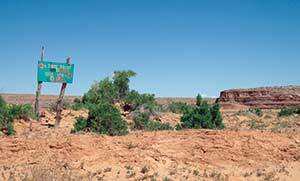 Once the road is paved in both directions, it will be a fairly major shortcut to Farmington from Chinle, and the chapter might be in a position to lure in a roadside business like a convenience store. But that's a long way off. "The worst thing," said Tsosie, is when you have to call the police or an ambulance. It takes them forever, and they might not find you once they get here." Name -- Tó Likaan means "Sweet Water," and refers to a little sandstone spring now little more than a seep. Land area -- 152,000 acres. Major clans -- 'Ashiih’, Hashtl'ishnii, Bit'ahnii, Tábaahá. Issues -- drought, terrible roads, lack of jobs. Assets -- Four Corners Hospital, Immanuel Mission, beautiful scenery. "We really need road numbers," agreed Julia Tom, who had stopped by the center to visit. To tell the truth, Tolikan needs practically everything. It used to have a thriving trading post, but it shut down in 1989 or 90. Head Start is defunct because the cook retired and the program's regulations prevented it from being run by just two people. What it does have is some beautiful scenery, the Four Corners Regional Health Center, which opened in 2007, and a very nice non-denominational Christian mission. Everybody likes the mission," said Tsosie. "It's part of us. You should go out there." Out there -- and it is really OUT there -- the mission administrator has equally kind words for the people of Tolikan, or Sweetwater, as it was called until recently, when it changed its name to the Navajo version. "We love Sweetwater Chapter," said John Bloom, who must because he's on his 26th year out here. "I don't think Sweetwater has much clout in the Navajo Nation, but the people are so good, so friendly, so supportive." The mission, established in 1924, gives to the community by offering programs, bazaars, celebrations and a school with a champion girls' basketball team (the boys aren't bad either). For decades, community members fetched water from the mission's excellent well, until running water came in the 1990s. For a while, it boasted the only telephone in town. The chapter, in turn, has declared the third Saturday of December "Immanuel Mission Appreciation Day." Bloom estimates the Christian population of Tolikan "in the teens" percentage-wise, but nevertheless 80 to 90 percent of the parents send their kids to the mission's school, Carrizo Christian Academy, rather than Red Mesa Elementary, just 15 miles away. "We're not here to change the culture, we're not here to put down anybody or force anybody," Bloom explained, but they all know when they sign their kids up that they're going to be taught the Bible, they're going to be taught about Jesus, they're going to be taught about the Christian religion. They want that for their kids." Or they might be focusing on Carrizo's excellent academic reputation and tiny class size (they graduate just three to five seniors a year, and are able to fund-raise for some mouth-watering junior/senior trips -- this year's was to New Zealand). All 26 of the school's faculty and staff members are volunteers, some of whom have been here since the 1990s. As for the budget, the school -- the entire mission, in fact -- relies entirely on donations and the occasional fund-raiser. "God supplies in amazing ways," beams Bloom. On the day the Times visited, for example, the mission was swarming with youthful energy: 40 sunburned young bilagáanas from Northeast Bible Chapel in Colorado Springs, Colo., were buzzing about, painting, cleaning and cooking. That's pretty much how it is here all summer long. Believe it or not, youth groups from across the country are falling over each other to come out here to the middle of nowhere to paint, pour foundations and clean bathrooms. They are even required to bring and cook their own food. Northeast was on the waiting list for 10 years before it was invited out, said Sarah Fritzler, 27, who's on her second summer at Immanuel. "Once you start coming, you have to come every year," Fritzler explained, or some other group gets your slot." You mean to say teens and 20-somethings are fighting over giving up a week of their summer to do stuff their parents can't get them to at home? "Yes!" laughed Fritzler. I know it's strange. I hate to paint and clean toilets at my house. But out here, there's a sense that it's for a greater cause." Breanna Gardner, a pretty redheaded teen with a sunburn that's going to hurt for a while, agreed. Even though she was on sewer-lagoon-weeding detail ("We tried to pretend it was just a regular pond," she said, wrinkling her nose). I love it because I get to fellowship with other believers and play with the Navajo children," Gardner said. "Usually when you get a group of teenagers together, there's all this drama. But here there's not. We have our personality conflicts like any group, but we have to work together and they seem to blow over by the next morning." Fritzler said she's inspired by the mission staff. They don't ask for money," she said. "They just pray for God to provide. You don't see that very often." No. And you don't often see a chapter where Christians and traditionals have nothing but nice words for each other -- in fact, we spent a whole day in Tolikan and didn't hear an unkind word about anyone. The little spring for which this chapter is named is no more than a seep these days, as Yazzie observed. But this place still flows with the milk of human kindness.